These days, Olympians have to pass random drug tests and steer clear of shady supplements to avoid the wrath of the IOC and World Anti-Doping Agency. 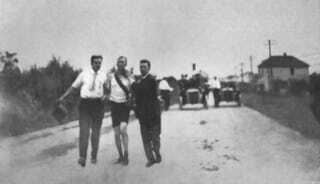 But back in 1904, during the Summer Olympics in St. Louis, Thomas Hicks of the United States (pictured above, middle) secured gold in the marathon race through both the blatant cheating of his opponent and some artificial means of his own. Alice Roosevelt, daughter of the President, was about to place his medal around his neck when he was exposed as a fraud. He had hitched a lift in a friend's car for 11 miles. So if Lorz hadn't won who had? The crowd had to wait another 15 minutes to find out. With nearly three and a half hours gone, Thomas Hicks staggered into the stadium more dead than alive. He'd almost given up after 16 miles, but his handlers had forced him to continue. He crossed the finish line with almost six minutes to spare over Corey. The Irishman, Newton, beat little Felix Carvajal for the bronze. His gregarious nature had cost the Cuban a medal. Hicks—like the original marathon runner, Pheidippides—nearly paid for his exertions with his life. As soon as the race was over he was rushed to the hospital, where he spent 24 hours on the danger list. Photographs taken at the time reveal a man in a total stupor. It didn't take long for the athletics world to find out why—in order to keep him in the race his supporters had forced him to drink, at every stop, copious amounts of brandy laced with strychnine. So he got shitfaced and won a gold medal? That's a good day's work there. And four years later, the brandy/strychnine cocktail played a key role in producing what came to be known as the world's first great sports action photo.